February 15, 2013—Premier Innovations Group, who own the brands Clique Vodka and Don Pantaleon Tequila, believes that with every alcohol promotion must come a social responsibility resource as well. The company owns the iPhone App ‘DrinkyPal’, which is a free download on the iTunes App store. 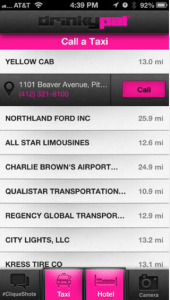 The DrinkyPal app lets users pull up a list of the nearest taxi companies and the nearest list of hotels to help prevent drinking and driving. You can now book a hotel room directly from your phone within the application, as well as call the taxi company directly. This iPhone app is available nationwide and works based off of the iPhone’s GPS system. DrinkyPal is available in the Apple iTunes Store for free, as well as a link from the scanned QR Code on the back of our Clique Vodka bottle. Nationally, alcohol-related deaths declined in 2010* by 4.9%. However, they still made up 31% of the overall traffic fatalities in 2010. In 2010, there were 12,426 alcohol-related vehicle accidents in Pennsylvania, which was a decrease from 2009 (12,712). “Being in the liquor business, it is our company’s biggest goal to stand out by accomplishing outstanding corporate and social responsibility. We are so proud of our branding department for putting together an application with cutting edge technology towards better safety against the potentially dangerous effects of alcohol consumption” stated Noah Cohen, CEO of Premier Innovations Group. * Please note that most 2011 and 2012 national drunk driving accident statistics have not yet been released.